A meeting with the national composer, UNESCO Peace Artist, Chairman of the Azerbaijan Composers Union Firangiz Alizade was held in Baku. The event took place at House-Museum of Gara Garayev on January 15, Day. Az reported. Director of the State Museum of Musical Culture of Azerbaijan, Ph.D. in Art history, Honoured Culture Worker Alla Bayramova told the audience that the house-museum has been running for a little over 3 months, but many events have already taken place within its walls. And so the first event in 2019 was a meeting with Frangiz Alizade, a student of Gara Garayeva. 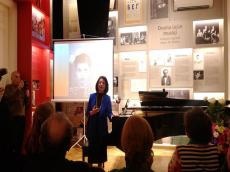 The event was attended by the daughter of Gara Garayev Zuleikha Garayeva-Bagirova, a student of Gara Garayev, composer Azer Dadashev, composer Sardar Farajev and other cultural figures. The works of Firangiz Alizade are included in the treasury of Azerbaijani musical culture, are well known and often performed outside of Azerbaijan. Today, the works of composer are performed by world-famous musicians. Her music pieces conquer the listeners of the most prestigious concert halls in many countries and continents. At the beginning of her speech, Firangiz Alizade shared with the public her memories of Gara Garayev. She was the first to write a book about the composer and published it in three languages: Azerbaijani, Russian, English. In her speech, Firangiz Alizade also told about her creative activity. The composer noted that she worked in Turkey and then in Germany. By the way, her book was published for the first time in Germany. Sharing her successes, the composer stressed the importance of the work "Nasimi Passion". The music piece was premiered in Amsterdam. Over the past years, Amsterdam Royal Concertgebouw has been implementing a project called Passions, which covers various religions (Orthodoxy, Catholicism, Judaism, Buddhism). The works of famous composers from different religions have already been performed. Finally, in 2015, the work of Azerbaijani composer was presented to the audience. The music piece was performed by the Royal Symphony Orchestra, choir and soloists. Thought her work, Firangiz Alizade presented Eastern philosophical ideas in a synthesis with modern means of musical expression. The uniqueness of "Nasimi Passion" lies into to the fact that the composer turned to musical instruments characteristic of the Sufi Mejlis. The musical composition was performed at the national music instruments such as balaban, canon, gosha-naghara and the classical instruments violin, cello and viola, which let the composer to create an amazing synthesis that captured the hearts of the listeners. With his wonderful performance, the soloist of the German opera house Avez Abdullah, created a fascinating visual image. At the conclusion of the event, the guests were shown a recording from the premiere. The music piece was greeted with a storm of applause. Firangiz Alizade is best known for her works which combine the musical tradition of the Azerbaijani mugham and 20th century Western composition techniques, especially those of Arnold Schonberg and Gara Garayev. Her works have been performed at festivals in Stockholm, Warsaw, London, Heidelberg, Amsterdam, New York, Boston, Los Angeles, Mexico City, Frankfurt, Berlin, Zurich, Bonn and Cologne. Alizade also enjoys long productive cooperation with Kronos, which has presented her works, including Mugamsayagy, Absheron, and Oasis since 1993. In 2016, "Dance", an academic work by prominent Azerbaijani composer Firangiz Alizade, was performed in the framework of tour, organized by the world-renowned Kronos Quartet. In 2017, Azerbaijan's State Academic Opera and Ballet Theater marked the 70th anniversary of prominent composer. Many art and public figures, as well as her admirers attended the event.